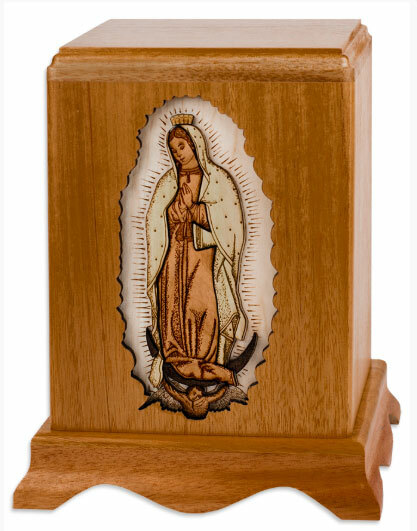 The Our Lady of Guadalupe Wood Cremation Urn has a beautiful rendition of the Virgin Mary in inlaid wood. Our Lady of Guadalupe or Nuestra Senora de Guadalupe is a recognized symbol of Catholics in Mexico. This is a beautiful urn for anyone of the Catholic faith, whether Mexican or of another nationality. The urn is easily accessed through a bottom plate which attaches with screws. 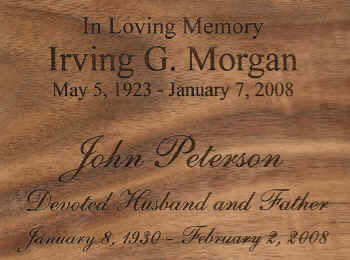 This urn can be personalized with laser engraving for an additional fee. Please limit the engraving of name, birth and passing dates, and short sentiment to no more than 35 spaces per line. Check spelling, punctuation, capitalization, and dates to make sure they are correct; you will not receive a proof. The engraving can be placed on the top of the urn or the back of the urn. Available in Oak (shown), maple, or walnut.